Police in Manchester, England has issued an apology, after a suicide bombing “simulation” which involved an actor shouting the Islamic phrase “Allahu Akbar” (God is greater) before detonating mock explosives. 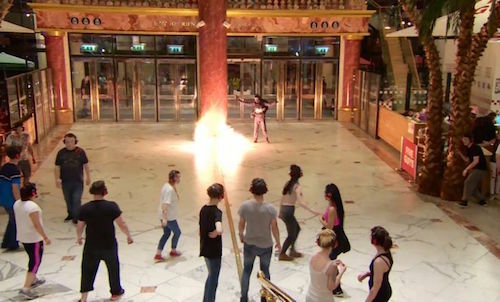 The simulated terror attack was held at one of the UK’s largest shopping centers, the Old Trafford Centre, and was part of a counter-terrorism training drill preparing for a possible Paris-style assault by jihadist terrorists. However, police later apologized for “linking Islam” with terrorism. The drill had been criticized by some politicians and Muslim activists, including The Community Safety Forum, an anti-Islamophobia organization. “This sort of thing panders to stereotypes and further divides us. It will increase anti-Muslim hate crime,” the group claimed. “For the past 24 hours, GMP (Greater Manchester Police), along with other agencies, has been hosting a counter-terrorism training exercise based at the Trafford Centre, which began with a mock suicide bomber detonating a bomb inside the shopping centre,” police spokesman Gary Shewan said. “The scenario for this exercise is based on a suicide attack by an extremist Daesh-style organisation,” he continued, using the Arabic term for the ISIS terrorist group, “and the scenario writers have centred the circumstances around previous similar attacks of this nature, mirroring details of past events to make the situation as real life as possible for all of those involved. “Linking” Islamic terrorism to Islam is now an offense punishable by career derailment. So, what is the actor carrying out a mock suicide bombing supposed to yell before he pulls the cord? Excelsior? Geronimo? (No, wait, never mind.) Take that, you Limeys? I suppose he had best maintain a discreet silence. Also on Tuesday, Italian police revealed that two Afghan nationals arrested in the southern Italian city of Bari were part of an Islamist terror cell linked to ISIS, which was plotting attacks in both Italy and Britain. Three other cell members are still at large, two of whom are believed to have returned to Afghanistan.